The End of the Mo | American McCarver. Your Sports Blog. 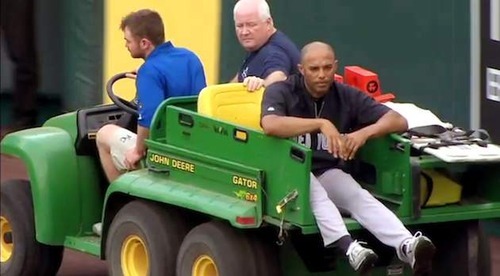 It wasn’t supposed to end like this for Mariano Rivera. No matter how you feel about the Yankees — and, believe me, I feel exactly the same way — it wasn’t supposed to end like this. One of the greatest pitchers — and certainly the greatest closer — in the history of the game, put down by a blown-out knee, shagging flies during batting practice? Oh, no. That’s not dramatic enough. That’s not glorious enough. That’s the ending of every weekend-league high-school-once-was, gone fat and forty, not for one of the best to ever play. It was supposed to end with Rivera pitching a low-outside fastball that Matt Kemp puts out of the park for a walk-off win in game seven of the World Series.